To ring in 2019 we headed to Maui to celebrate our friends getting married! We had a beautiful sunrise and some great views of Molokai and Lanai on our flight over. We arrived on Saturday morning and had breakfast in Paia at Paia Inn Café. Pineapple mint jalapeño juice. Delicious but so spicy! After breakfast, we drove around and then headed to Lahaina to check in and get ready for dinner. We made reservations to visit our favorite restaurant, Mama’s Fish House, for dinner. On Sunday, we walked around Lahaina and then met at Hale Pa’ahao Prison for the rehearsal before the rehearsal dinner at Old Lahaina Luau. Hanging out at the prison! Monday was the big day! The girls started their day at the Royal Hawaiian getting ready for the ceremony. We all got to wear the most incredible flowers in our hair! Caitlin was just stunning and we had a blast getting beautiful! Beautiful rainbow to start our morning! Can’t get over how beautiful the flowers were! Next stop, the prison! It was a beautiful ceremony with more unbelievable flowers. After the ceremony, we boarded a whale watching boat to cruise around Maui, Lanai, and Molokai. We saw whales and an incredibly sunset. Next stop was Down the Hatch in Lahaina followed by dancing at Monkeypod to ring in the new year! It was such a wonderful day celebrating! Shots for Jake’s birthday at midnight! Our last day started with a short hike to view Puu Pehe rock. Such a beautiful morning and we had it all to ourselves! Decided to stop and explore the tide pools. I wasn’t ready for the picture :). But what a good picture of Josh! After our hike, we went back to the hotel, packed up our stuff, and checked out of the hotel. Our last stop on our trip was Shipwreck Beach. It was QUITE windy but we had a great view of the largest shipwreck! After Shipwreck Beach, it was time to return the car and head to the airport. We had such an amazing time and packed a TON in to a weekend! On our second day, we got up and had breakfast and coffee at the hotel and took full advantage of the big rocking chairs looking out over the front lawn. After breakfast, we packed up the Jeep for our adventures that day. First stop was the Munro Trail. We didn’t do the whole thing, only the first couple of miles. We found a really cool swing and stopped at a lookout that had some lovely views of Maui and Molokai! The view on the way to the Munro Trail. Just love those pine trees! Stables at Koele. So beautiful. The next stop was Garden of the Gods. The trail there was insanely muddy with tons of potholes due to the amount of rain Hawaii saw in the early Spring. It made for quite the adventure! After taking in the view for a bit, we kept going down to Polihua Beach. The last time Josh and I were here, it was SO windy we couldn’t even enjoy it. Luckily, this time it was perfect. We sat for a long time and just enjoyed the empty beach and sunshine! I thought this was a really cool picture. After plenty of sun, it was time to head back! It took us a little over an hour without any stops due to the rough terrain. The Lanai cat sanctuary needs to come find this guy! Holding on for dear life! Once we got back, we wandered around Lanai City for a bit and relaxed before dinner at Lanai City Bar & Grille. Dinner was at our hotel, so quite convenient! We sat outside and listened to live music for a couple hours to end our night! The best thing ever…bananas foster deliciousness! In April, we took a long weekend trip to Lanai with my mom and Tom. Josh and I left early in the morning on Friday so we could go visit the Lanai Cat Sanctuary, which we missed on our first trip. We picked up our jeep and went to Blue Ginger Cafe in Lanai City for breakfast. After that, we drove back towards the airport to go visit the kitties! We spent three hours (and I could have spent more) feeding them treats, playing with them, and giving them attention. The facility and staff were wonderful and I love their mission. We also sponsored a cat for a year (her name is Ava and she’s pictured below). She’s 11 and SO sweet! Can’t wait to go back! They had tons of fun hiding places. Ava! We sponsored her in place. Naha escaped while we were leaving and wanted to come with us. How to grow a cat. They didn’t really want to be friends with us. After we pulled ourselves away from the kitties, we checked in to Hotel Lanai and changed to go pick up Linda and Tom from the airport. After picking them up, we walked around Lanai City for a bit before heading to dinner at One Forty at The Four Seasons at Manele Bay. The dinner setting was beautiful and the food was delicious! Our last day, we woke up and enjoyed coffee and hot bread one last time on our lanai. We also wandered out to the edge of the complex to check out the view. We were able to get Maui, Lana’i and Kahoʻolawe all in one shot. A great way to end our trip! A few weekends ago, Josh and I hiked the first peak of three peaks. For me, this was the second time hiking it. It was a beautiful day, not windy and clear enough to see Maui, Lanai and Molokai. Such a great hike! On our last day in Lanai, we decided to do a hike and check out the Lodge at Koele (one of the two Four Seasons on the island). We started our morning with breakfast at Hotel Lanai and then walked about a mile to the Lodge, as the trail started behind one of the two golf courses there. The Lodge at Koele. Beautiful! Love the architecture of this building. We hiked the Koloiki Ridge Trail at a pretty brisk pace as we had to get back for Becca and Ben to catch the shuttle to the harbor. We wanted to make sure we had time to get stuff together and maybe grab a quick snack before we all left Lanai. It turned out to be a beautiful hike! We weren’t expecting much, as we had done everything else on the island. It was recommended by someone staying at Becca and Ben’s b&b as something fun to do but not a necessity. It turned out to be a blast and a great workout! We got a little lost on the way back, but still made excellent time. Becca, Ben and Josh hiking the trail. Beautiful view of both Molokai and Maui on Koloiki Ridge. After our hike, we stopped and had smoothies and an açaií bowl at Anuenue Juice Bar & Cafe in Lanai City before heading our separate ways. Becca and Ben headed for the ferry to Maui and Josh and I enjoyed wandering around the shops looking at different things before we headed to the airport. It was such a great trip and even though I feel like we successfully crossed off this island, I would LOVE to go back! Smoothie special of the day…I can’t remember exactly what was in it besides chocolate, chia and cinnamon. A memorial for the fallen soldiers from Lanai from multiple wars. On our second day there, we got up and had breakfast at our hotel before venturing out for some more off-roading. 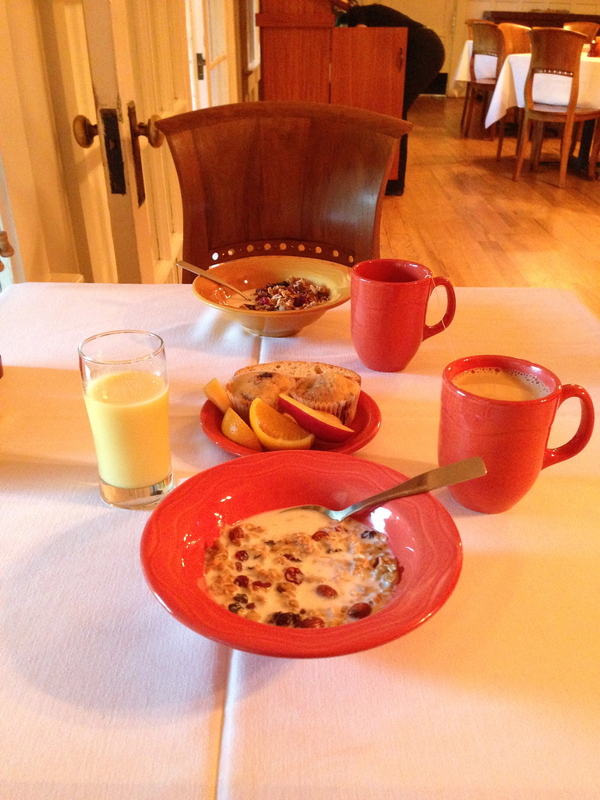 We had granola, fruit, coffee and orange juice. Our breakfast at Hotel Lanai. After breakfast, we met Ben and Becca and headed to our first adventure of the day in the jeep…the Munro Trail. We were hesitant about this trail because the rental car company said it was closed to jeeps. However, after much research we established that it could be driven and that people did it all the time. It turned out to be the easiest off-roading adventure we had our entire time on the island. It also was the prettiest! Looking into an offshoot of the Munro Trail. Becca and I in the back of the very dusty jeep. We were covered in red dirt. Random gate that we went through to check out the view. Pretty awesome view from the jeep. The Munro trail marker at the end. Trees along the highway…Ben’s favorite thing. After the Munro Trail, we headed back to Lanai City to grab some stuff for a picnic and headed toward Shipwreck Beach (Kaiolohia) on the northeast corner of Lanai. We sat on some rocks and enjoyed the views of the 1940s oil tanker that still sits on the reef today after being beached there for the past 70 years. We also were joined by numerous sea turtles hanging out in the water near us. Quite a surreal lunch! The sign before Shipwreck Beach. I love this picture. After having a peaceful lunch with the turtles, we headed to South Lanai to do some snorkeling along the beach at Hulopoe Bay. Ben had never been snorkeling, so it was a first for him (even though he’s scuba dived). We got some great video footage of our snorkel adventure! The view of Hulopoe Beach on our way to Pu’u Pehe Rock. After a couple hours of snorkeling, we hiked a short trail to the left to Pu’u Pehe (Sweetheart Rock). I was expecting it to be a cool iconic rock, but we turned the corner and were blown away by the how striking it was. There is a reason it is one of the most photographed places on Lanai. We walked to the top of the cliffs (where someone was actually proposing right as we got near the top). We had a great view of the small beaches down below. We could also see some of the bright yellow fish we had seen snorkeling earlier from all the way up there (about 100 feet). Looking back at the beaches. Sea cliffs near Pu’u Pehe. After climbing back down from viewing Pu’u Pehe, we packed up the jeep and headed back to Lanai City. We returned the jeep, showered and got ready for dinner at Lanai City Grille (which conveniently for us was located in our hotel). I had read nothing but great reviews and wanted to make sure we made a stop here on our trip. The restaurant did not disappoint! We all split entrees and they were still huge portions! It was a great last evening on our vacation :). Josh and I’s appetizer: Crab Dip with Tortilla Chips. Becca and Ben’s appetizer: Ahi Poke Tacos. Pecan Crusted Fresh Mahi Mahi that Josh and I shared. BBQ Baby Back Ribs that Becca and Ben shared. On Saturday, Josh and I headed to our final island (of the six that you can actually travel to) which was Lanai. I will say that we had expectations for a really cool trip, but that the island absolutely blew our expectations away. We had a phenomenal time for the three days we were there and would love to go back even though we saw pretty much everything we could possibly see. We landed around 7:00 am and picked up our jeep and head to Blue Ginger Cafe for breakfast. We both had breakfast sandwiches and then started our adventure. Almost all of Lanai is seen by off-roading in a jeep….which was pretty incredible and also VERY bumpy in portions! Breakfast sandwich from Blue Ginger Cafe. Our first adventure was heading to the Garden of the Gods (Keahiakawelo). Garden of the Gods is a natural rock garden…when you are standing in it you feel like you are on Mars…definitely not in Hawaii! It was incredibly beautiful and unique! We also drove through the Kanepuu Preserve to get there. It is the largest remains of a dry land forest in Hawaii. It was quite scenic with the red dirt and pine trees. On our way to the Garden of the Gods. The red dirt is caked on the trees. Super pretty! Josh in the Garden of the Gods. After stopping at the Garden of the Gods, we continued on to Polihua Beach on the north side of the island. The beach was about two miles long and there were only two other people there (which is a lot for this beach). It is located across the channel from Molokai so we had great views! It was incredibly windy, so not the best beach for laying out and getting a tan, but we did sit and enjoy the solitude for a couple of minutes. The drive was incredible to Polihua Beach! Driving up to the beach. Great picture! After a very bumpy off-road adventure to Polihua, we headed back toward Lanai City to the south of town to find the Luahiwa Petroglyphs. We had a bit of trouble finding them on the maze of red dirt roads, but once we found them it was pretty cool to see! It is one of the largest collections of petroglyphs in Hawaii and are from the 15th Century when Lanai was first settled by ancient Hawaiians. This sign pointed to two roads…not helpful. The lava rocks with petroglyphs on them! After the petroglyphs, we headed further south to continue our education of the ancient Hawaiian culture to Kaunolu Village. Kaunolu Village is the remains of a historic fishing retreat for Kamehameha I. We saw the remains of a heiau, many remains of buildings and Kaneapua Rock. Panoramic of the shore and Kaneapu Rock. After touring Kaunolu Village, we headed back toward Lanai City to grab a quick snack and check into our hotel. We had a smoothie and an açaí bowl at Coffee Works and checked in at Hotel Lanai. Our hotel was incredible. Built in 1923 with 10 rooms and a cottage, it was quite the historic gem and we loved staying there! My smoothie from Coffee Works. Josh’s açaí bowl from Coffee Works. Unique flower in front of our hotel. While I checked in at the hotel, Josh went to pick up Becca and Ben at the airport (we had a two door jeep so it was a tight squeeze with their luggage and three people). They checked in to their B&B and we all met up for dinner! We had calamari and a great pizza at Pele’s Other Garden then headed to Kaumalapau Harbor for the sunset. It was beautiful! We actually got to see the sun hit the water..no clouds blocking it! It was a great way to end our first day on Lanai! Becca and Ben enjoying the sunset. Josh, Becca and I enjoying the sea cliffs..that Josh was obsessed with. Josh, Becca and I enjoying the view! Amazing clouds right after the sunset. Molokai on the left and Maui on the right.